Two years ago, our family moved back to the rolling hills of southwest Virginia. My husband had been raised here, and even though we had literally traveled the world, he never could quite escape them. I grew up 300 miles north but have found that there is something very familiar about this area. The small communities. The strong sense of place. And family roots that run as deep as the white oaks’. Still, I’ve had a lot to learn in the last two years, to learn the stories that make this place what it is. Most recently, I’ve been learning about the unique price that southwest Virginia paid during World War II. You may have heard of Bedford, VA, a small farming community that sits in the county next to us. When American troops stormed Omaha Beach on a cloud-covered June 6, 1944, many of Bedford’s own sons were among the first out of the boats. The first to be mowed down by German guns. But these “Bedford Boys” hadn’t signed up to be heroes. They were farm boys who had joined a local National Guard unit, simply looking for work. When WWII came, they shipped off to England and eventually found themselves part of the Normandy Campaign. Of the 28 who landed on the beach, only 6 survived. Today, Bedford is home to the National D-Day Memorial that commemorates the sacrifice of so many others like them. But Bedford is not alone.Thirty miles to the west, nestled in the foothills of the Blue Ridge just outside of Roanoke is a little community that my family now calls home. According to the sign that greets you on Rt. 116, it’s Mt. Pleasant; but we don’t have a post office to prove it. We do have our own elementary school, a fire department, and a Rec Club. And we do have churches—Methodist, Brethren, and several varieties of Baptist. If you turn west off Rt. 116, you’ll find a road that meanders away from the community’s center, rising and falling with the contours of the hills. It passes horse pastures, dilapidated barns, and neat brick homes built on family land. Travel this road far enough, and you’ll come to a small country church that was first named “Brook Hill Community Church.” True to her name, she’s flanked on her left by a brook, flowing through a cow pasture. On her right is a cemetery. This is the church that my husband pastors, the one that brought us back to southwest Virginia. If you walk through her front doors and up the steps to the vestibule, you won’t see anything much different from any other country church. A coat rack. A table stacked with Sunday’s bulletins. The doors that lead to the sanctuary. But if you’ve an eye for detail, you might notice an unassuming plaque that hangs on the wall opposite the water fountain. It is roughly two feet by three and holds the names of over fifty men. For the last two years, I’ve walked past it on my way to the choir loft, stood by it while waiting for the ladies room, and occasionally paused to read it with no understanding of its significance. Finally, one Sunday, I pulled a long-time member aside and asked her why it was there. She couldn’t remember exactly and we both agreed that we needed to find out before it was lost from our church’s collective memory. Come Monday, I’d already forgotten. But then, Tuesday night, the night of our women’s Bible study, another long-time member walked up to me and handed me a piece of folded paper. The front was emblazoned with a large patriotic crest and underneath it were the words “Unveiling of Plaque.” It was dated August 15, 1943 and the inside listed two columns of names—the same names that hung on the wall. And then I understood.These were the “Brook Hill Boys.” Fathers, sons, uncles, brothers. Men from our little church and community who had left the familiarity of these mountains to wage war in Europe, Africa, and the Pacific. Realizing what it was, several of us formed an impromptu gathering around the plaque. And as we did, the memories came flooding back. One by one, they began pointing to names. And then someone pointed to a name with a gold star next to it. We fell silent, no one quite knowing what to say. Not simply because this one name had a gold star, but because so many others did as well. 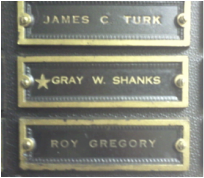 Because there it was: a story of life and death, of courage and sacrifice, of love and commitment—all represented by a single, unassuming, gold star next to a name on a plaque in a small Virginia church. I don’t know if any of those men were on Omaha Beach on June 6, 1944 with the Bedford Boys, but I do know that they were the same kind of men. They are the same kind of men who live in this community today. They are quiet, unassuming men. They are men who hunt and farm and work. They are men who’d rather be home in these mountains with the women they love than anywhere else in the world. But they are also men who, having learned to be faithful in little things, became faithful in so much more.